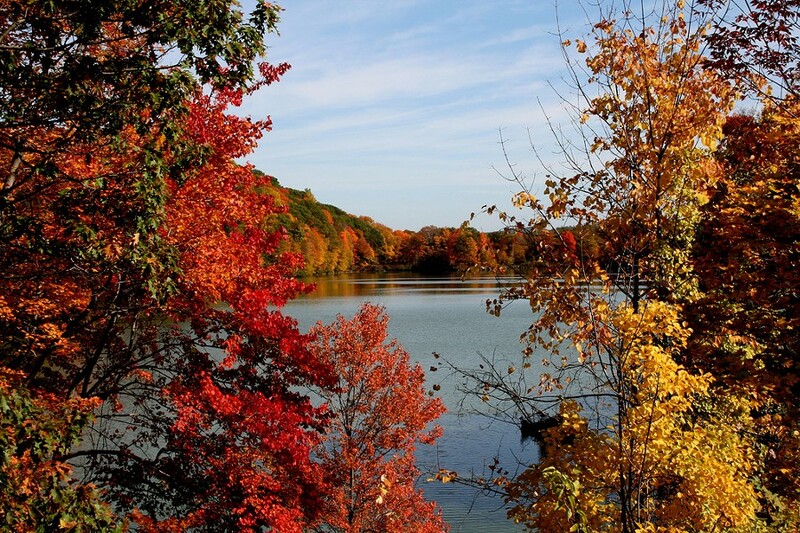 The Hudson Valley, and the Northeast at large, is widely known for the spectacular fall foliage, owing in large part to the diversity of species. Sugar Maples, which grow especially densely in the Catskill Mountains, produce some of the most brilliant fall colors—a bright gold. Our region's reputation for fall foliage is also due in part to the rolling landscapes themselves, which are made still more beautiful by the fall foliage—whether you’re visiting the High Peaks of the Adirondacks, the famous “Wind Gate” where the Hudson River forms a wide chasm between Storm King Mountain and Breakneck Ridge, or the Shawangunk Ridge. Generally we simply accept our lucky fate to live in this beautiful area without ever stopping to ask why and how the leaves change color. There is a biological reason for nature's autumn gallery. Here’s a look at the science behind fall color change, and a few prime spots in the Hudson Valley for enjoying the fall foliage. Trees that drop their leaves are known as "deciduous" from the Latin word decido meaning "fall off.” Many (but not all) of these trees change color in preparation for leaf drop. Deciduous trees detect the shortening periods of sunlight that signal the coming of winter, and they respond with a kind of preemptive strike, shedding their leaves before the frost can damage them. Plants contain three main pigments that determine their color—chlorophylls, carotenoids, and anthocyanins. Changing levels of these pigments account for the pre-drop color display. Chlorophyll gives plants their characteristic green color and also facilitates photosynthesis—powering growth and sugar-making (including the sugary sap that can be boiled down to maple syrup). In the fall, the key event that initiates color change is the breakdown of green chlorophyll into colorless products, allowing the other pigments to influence leaf color. Once the green chlorophyll starts to break down, fall leaves can turn brilliant shades of yellow, orange, and red. While scientists are still learning about the exact process, it’s usually said that yellow and orange carotenoid pigments are already present in the leaves and are merely unmasked by the breakdown of chlorophyll. However, some carotenoids do seem to get converted into different pigments during the fall, and this may contribute to color change. Red is a little different. 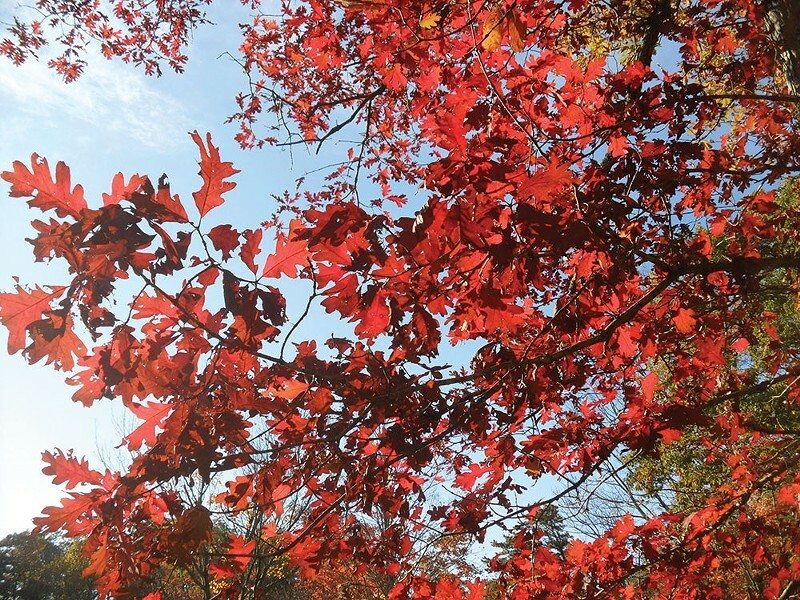 Anthocyanins, the pigments that turn leaves red in the fall, are synthesized from scratch within leaves during fall color change, perhaps in response to bright, cold days. The process of leaf color change is analogous to the color change of fruit ripening—such as a green banana turning yellow or a green pepper turning red—and many of the same pigments are involved. While there are still unanswered questions about the biological function of leaf color change, scientists agree that this process is an important part of how deciduous trees conserve energy. When chlorophyll and other components of green leaves are broken down into more basic chemical building blocks, trees are then able to recapture some of the nutrients originally used to make those leaves. This nutrient recycling allows deciduous trees to minimize the energy loss that results from shedding leaves. Nitrogen is a scarce and valuable nutrient for plants, and the dynamics of nitrogen storage offer another piece of support for the explanation that fall color change is driven by nutrient recapture. It turns out that deciduous trees which are especially rich in nitrogen, such as alders, don't fuss with autumn color change. Instead, alders drop green leaves. Since they acquire plenty of nitrogen from the bacteria that live among their roots, they do not have the same need as other trees for nutrient recovery through fall color change. Evergreens and deciduous trees use contrasting strategies to conserve energy. One part of the story is that it takes more energy to construct cold-tolerant evergreen leaves, such as pine needles, compared to deciduous leaves. 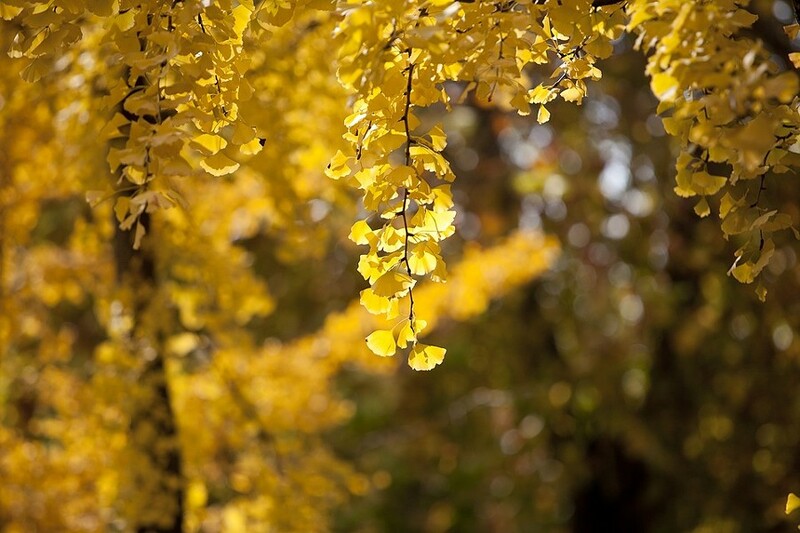 So even though deciduous trees must make new leaves each spring, and then drop those leaves each autumn, those leaves were less energetically costly to begin with. And color change further helps to recover some of those energy losses, making leaf drop a less costly strategy than if leaves were dropped while still green, nutrient-rich, and full of chlorophyll. Now that you know a little more about the rhythms of fall—and the reasons for color change and leaf drop—there are many excellent ways to get outside and enjoy the Hudson Valley's changing colors. In order to time your plans to match the color change, you can visit "I Love New York" for weekly fall foliage reports. A new report is issued every Wednesday afternoon. Hiking is one of the best ways to see the colors. But the fall is also a very busy time for hiking, so you may want to opt for less-trodden paths. For instance, Storm King Mountain offers sweeping, magnificent views of the Hudson River and Breakneck Ridge, but rarely experiences the same crowds as Breakneck itself. Minnewaska is particularly lovely at any time of year, and the quartz conglomerate rock, scrubby dwarf pines, and clear lakes form a pleasing contrast to the fall colors. Another alternative to Breakneck Ridge that is less busy, but still accessible by public transit is the Appalachian Trail near Pawling, NY. This is an area that is often less crowded than it deserves to be. The hike from the train station out to Nuclear Lake is lovely. Despite the somewhat intimidating name, the lake has been properly cleaned up. The Storm King Art Center is a nearly peerless setting for promenading and picnicking amidst the fall colors. This 500-acre outdoor museum offers giant modern outdoor sculpture set amidst rolling, tree-covered hills. If you can manage to make it here with some good company on a weekday this fall, you will have a treat and likely avoid the leaf-peeping crowds. Dia:Beacon is another Hudson Valley art museum, that offers a garden courtyard and beautiful grounds for walking and enjoying the fall colors. The museum and nearby Long Dock Park, with its kayak rentals and panoramic views of the Hudson River, are both accessible via the Metro-North Beacon stop. One final recommendation for enjoying the fall foliage is the Walkway Over the Hudson, which spans the river between Highland and Poughkeepsie. Originally, this structure opened in 1889 as an active railroad bridge. Since then, it has been refitted as a public park, reopening in 2009 with pedestrian and bike access. It is accessible via the Metro-North Hudson-Line train to the Poughkeepsie stop, and (more immediately) by a glass elevator that ascends to the Walkway from the Poughkeepsie side, providing an excellent vantage point. From the bridge itself, you have an expansive view of the Hudson River and the fall foliage in both counties.